A radical transformation of Piazzale Michelangelo is coming, with the project of making the terrace a pedestrian-only area. 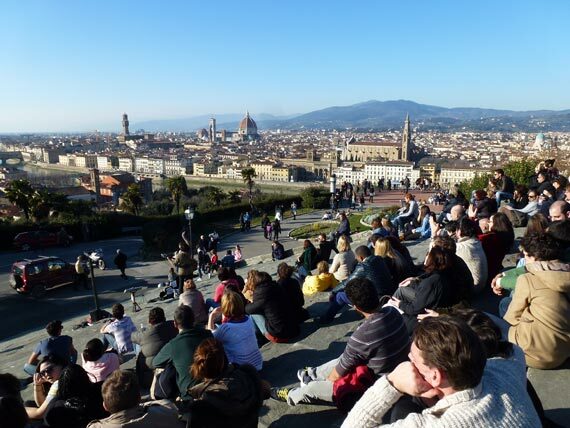 The terrace over the city is a very popular place for both visitors and locals alike who love the spectacular view of Florence at all times at the day, particularly magical at sunset. Right behind the balustrades where people lean to enjoy the view, the square offers a bronze copy of Michelangelo’s David and of the group of sculptures – Dawn and Dusk, Night and Day – by Michelangelo within the New Sacristy in San Lorenzo. And all around, you’ll find souvenir stands and refreshment trucks, plus over a hundred cars that take advantage of one of the last remaining “free” parking spots in town. All this is about to end. “The year 2016 will mark the urban and cultural rebirth for the piazza”, said Florence’s mayor, Dario Nardella, as he finally unveiled part of the project that has been rumored about for the past year. Overall, the project will be an investment of over 5 million euro with 2 years of works along the entire hillside, from the piazzale and down the paths that lead all the way down to Piazza Poggi and the tower of San Niccolò. – NO MORE FREE PARKING: the piazza has 196 parking spaces now, by the end of January 2016, the spaces will be reduced to 78 and these will become PAID parking spots. 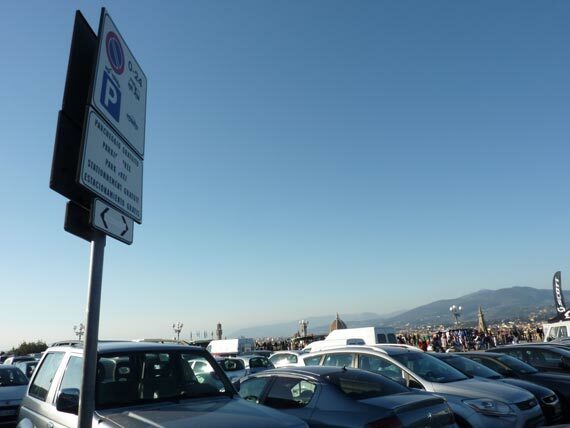 An additional 80 spaces will be created in the area near the piazzale for a total of 158 spots, but all will be paid to encourage cars to move. The first hour should be 1 euro, but 2 euro for every hour after that (valid from 8am to midnight). Work will start January 18. 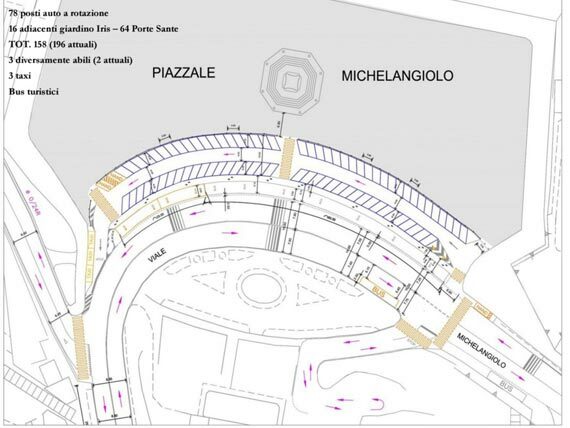 The map below shows how parking will be set up – with only two rows of parking at the Piazzale, one entrance at one end to better manage flow. 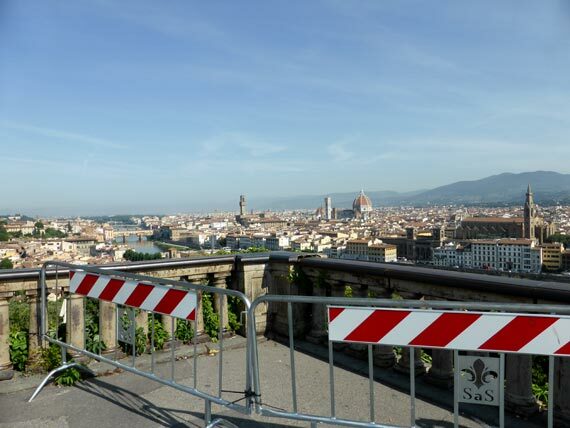 – BALUSTRADES COME FIRST: some parts of these are in terrible condition and have been cordoned off for months, so we are glad the project will start from here. Then the entire ground of the piazzale should receive a facelift. These are the works foreseen for 2016 but only for the 3 sides facing out, the side for the Iris Garden will be done later when the garden itself is renovated. – VIA CRUCIS/MONTE ALLE CROCI: the stairs from Via del Monte alle Croci that lead to the Church of San Salvatore al Monte behind the Piazzale will also be restored. – RAMPS, BASTIONS, FOUNTAINS: from Piazza Poggi, you can take a series of stairs and ramps up the hill to reach the Piazzale. Along these, along some sections part of the street has been closed for months, while the grotto fountains from the late 19th century are in terrible condition. All of this area will undergo work and restoration to make sure the area is safe. – NEW, MULTI LEVEL TERRACE: to one side of the stairs of Monte alla Croci, on the site of where an “abusive” bar/restaurant was demolished, a new terrace will be built, offering several levels from which to enjoy the Carraia valley between the two hills where the Piazzale and the Forte Belvedere are located… and a new view on to the city! – VIALI: extra maintenance of trees along the Viale Michelangelo. – SAFETY: A small building/office will also be built to have a fixed station for local police. The inauguration of the new pedestrian zone will occur on February 14, when the mayor has asked all couples who wish to enjoy a romantic kiss on “the most romantic and beautiful terrace in the world” to head to the Piazzale and enjoy it simultaneously. 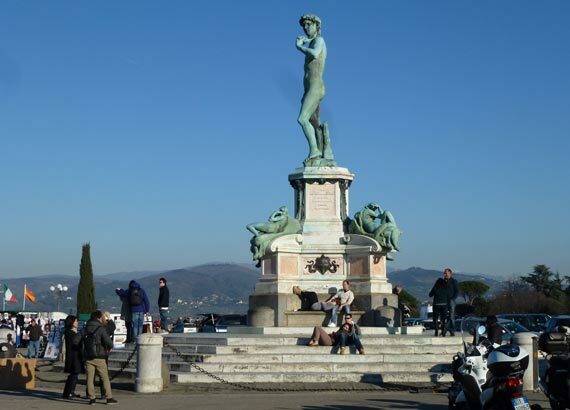 The city is also planning to then be able to use the piazzale as a location for cultural and artisan events, particularly during the summer when the city hosts a whole program called “Estate Fiorentina”. One million euro have been donated to start this transformation by the Starhotels hotel chain, founded in Florence 35 years ago and now present across the world. Private donations in cultural projects will be particularly attractive this year given the Italian goverment has approved a tax deduction of of 65% on donations.